Arcade Street Fighter Zero 2 Alpha (JPN) in 03:19.0 by error1. Street Fighter Zero 2 Alpha is a rebalanced version of Street Fighter Zero 2 (known as Street Fighter Alpha 2 outside of Japan). 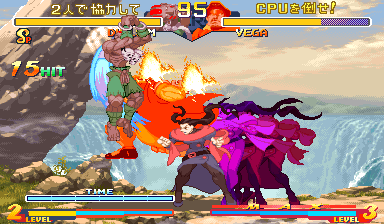 Despite the game's nonsensical name, error1 creates an entertaining run of Dramatic Battle mode, controlling both players against the cpu and using them to pummel his opponents with style. He uses the combination of Dhalsim and Rose to create entertaining combos.